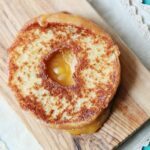 This Tom and Chee inspired recipe makes the most amazing sweet and savory grilled cheese donut! Cheddar cheese is slowly melted between a buttered glazed donut for a fun sandwich recipe. Recently, I was lucky enough to travel with my husband to Kentucky on a work trip. We saw the sights and ate all of the food. It was glorious. One of my favorite places had to be Tom + Chee. They have a menu filled with mouth watering grilled cheese sandwiches. The BBQ bacon and pesto turkey were insanely delicious. I was so full and almost passed on their signature grilled cheese donut, but was talked into it by my husband. It sounds weird. You almost don’t want to bite into it… But the gooey cheese seeps out of the side and the glazed donut is grilled to perfection. It calls for you to dive face first in. Honestly, I didn’t even share with my husband. He had to order a second. I don’t even feel bad. What is a donut grilled cheese? Honestly, this dessert recipe is exactly what it sounds like… A grilled cheese made with a donut. The bread you would typically see in the classic grilled cheese recipe is replaced with a fresh glazed donut. The donut is sliced, spread with butter, and grilled with cheddar cheese sandwiched between. What donuts make the best grilled cheese? You can try any yeast based donut. However, I suggest staying away from cake donuts. They tend to be crumbly and do not slice well. Classic glazed donuts do the best and pair with the cheddar cheese amazingly. Place a skillet on the stove over medium heat. Use a bread knife to cut your donut in half, creating two slices. Flip them inside out and lay them sliced side up on a plate. Spread both pieces with softened butter. Place one slice of donut, butter side down, on your hot pan. Layer cheese and the remaining donut piece. Cook one minute on each side, or until browned and cheese is melted. YES..you SHOULD try T & C…the menu board is fantastic and the choice will NOT be ez ! Oh wow…I kind of wish I hadn’t seen that! Everything in moderation, right? Now where can I get a donut, like, right NOW? I love salty and sweet together so I may have to give this one a try – yum! I was not brave enough to try the grilled cheese donut while I was there, but the sandwiches we did try were absolutely delicious! I have heard of burgers on donuts, so this might be fun to try as well! YES! Can’t wait! So remind me – what was your fav cheese combo on these delicious donuts? And thanks for the link back!! Love your face! I loved Gruyere. Gives it a salty sweet taste. Or sharp cheddar. I’m not a donut fan, but hubby sure is. AND he loves grilled cheese. I may have to make this tasty treat for him! I actually only figured that one out the hard way. I didn’t flip the first one and it was a sticky mess! I want to try this just to see! Looks delicious! Wow! This is not on my diet. But if I ever have some doughnuts and cheese around I will need to try this! This is quite the odd combination. However, I said that about chocolate covered potato chips and those things are amazing. I might have to give this a try. Wow!! How cool and interesting is that? I never would have thought to use donuts as a “bread”. Very cool. Speaking of a grilled cheese shop, have you tried Melty Way in Salt Lake City? Lots of yummy melty cheesy sammies! Love it. Jess!! This looks delicious :)!! wow cheese and donuts? yumm I might have to make this for my donuts loving husband! PS: Amazing photography as always!